In late December, the ringed planet Saturn will be sitting very low in the southeastern sky before dawn. On Tuesday, Dec. 27, the old crescent moon will sit only 5 degrees to the northwest of (above) the planet. The best viewing times are between 6:15 a.m. and 7:15 a.m. local time. Early Tuesday morning (Dec. 27) we all have an opportunity to get our first look at the ringed wonder of the solar system, Saturn, in the early morning sky. Of course, it does not hurt to have a benchmark to positively make a sighting and that's where the moon comes in; appearing as just a hairline sliver of light, only 3 percent illuminated by the sun. On Tuesday morning, 45 minutes before sunrise, look for the moon low in southeast sky. And if you look straight down below it, close to the horizon, you’ll see a moderately bright "star" shining with a yellow-white hue. That will not be a star, but the planet Saturn. The distance between the moon and Saturn will measure about 5 degrees. As I have said many times before, your clenched fist held out at arm's length measures roughly 10 degrees. So on Tuesday, Saturn will be about "half a fist" below the razor-thin lunar crescent. Two things will markedly increase your chances of making a sighting. 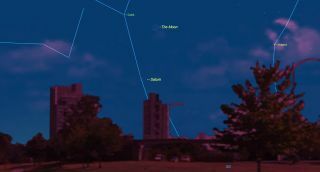 First, make sure that you do not have any obstructions such buildings or trees toward the southeast part of the sky that could block your view of either the moon or Saturn. Secondly, it would help if you scanned that part of the sky with good binoculars, which will certainly help in your picking out the moon and Saturn against the brightening sky. Once you hit upon the moon, finding Saturn should be easy; just drop an imaginary plum line straight below the moon and you will hit upon Saturn. The year 2017 will belong to Saturn, for this is the year its magnificent ring system will be at their maximum tilt toward Earth. That will actually come in October, when the tilt will be equal to 27 degrees, though right now the rings are practically at their maximum … currently tilted 26.8-degrees toward us. If you have a telescope, you'll have to wait a while for Saturn to get high enough above the horizon and above any horizon haze for you to get a good view of it. If you try to look at it through a telescope on Tuesday morning, you likely would be disappointed because objects near the horizon tend to have their images quiver or "boil" because of atmospheric instability. You’ll have to wait several more weeks for Saturn to climb high enough in the sky and far enough from the dawn glow to make it worthwhile to look at through a small telescope. But at least be advised that Saturn has begun the process of emerging back into view and that 2017 promises many great nights observing the sixth planet from the sun. The Lord of the Rings is back! Joe Rao serves as an instructor and guest lecturer at New York's Hayden Planetarium. He writes about astronomy for Natural History magazine, the Farmer's Almanac and other publications, and he is also an on-camera meteorologist for Fios1 News, serving the Hudson Valley of New York. Follow us @Spacedotcom, Facebook or Google+. Originally published on Space.com.